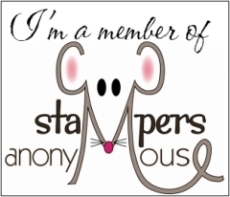 Welcome to our Stampers Anonymous SU blog tour! Tonight we are delighted to show you projects using products that were available to us in our demo sneak peek from the 2011- 2011 Idea Book & Catalogue. You may have just come from Michelle Marchant’s blog, but if you are starting here, don’t worry…. you can make the complete tour just by following the links at the end of each post. There are 14 stops along the way and we hope you will visit each one to see the wonderful creations we have to show you! Please feel free to leave some comment love along the way…. At the end of each post there will be a link to take you to the next stop on the tour. My projects are all made using the wonderful new Greenhouse Gala DSP along with the coordinating stamp set ‘Friends Never Fade’. I’m really loving this DSP and stamp set and can’t wait to get my hands on the 2 new colours that coordinate with it also. Here’s a closer look at each of my projects. Next up I made the Glass Photo Coaster set. and to see the colours…. Accessories: Real Red Grosgrain Ribbon, Wide Oval Punch. I hope you’ve enjoyed my creations. Now you’re off to enjoy the wonderful creations of Sally Williams. Thanks for stopping by! If you happen to lose your way here’s a list of all participants. Stunning!! What a great job. I am inspired. Beautiful tote, matching card and post-it note holder. I love the coasters. Great work. WOW Nikki – VERY classy projects! Love all that you made Nikki. Great idea with the coasters. I would not have thought about that. Great set – LOVE the coasters! I really loving this new DSP. SO classy Nikki -they look great! Wow! The DSP and stamp really work well together! I love your projects! Now Nikki – how come I knew you would do this set and DSP perfect justice? Love your creations. Wow Nikki… these projects are soooo beautiful! You have inspired me to branch out and try some other things… love your tote!!!! The new DP is very rich and bold….definitely makes a statement!! I love the post-it/pen combo. So much fun to make!! FAB projects Nikki. Love your work, as always Nik! I love this DSP and the stamp set, and I love what you have done with them! I’ve got to know how to make that tote, it is divine! Thank you for the lovely comments. The tote is one of Lauren Meader’s templates. Love all the projects Nikki! I actually looked yesterday but got distracted & closed down screen & then remembered I didn’t leave comment. I too have now “seen the light” with this paper, I didn’t get on the pre-order but did order it y’day oh my poor credit card! I have spare set of those coasters so going to CASE you’re idea as love what you’ve done. Love the creations especially the coasters, how did you make them? They are Glass Photo Coasters and have a 2″ x 3″ section for a photo or in my case a stamped image and some DSP.